So the Witcher 3: Oh my God it has been so long since I have binged on a game this hard. Nowadays I will typically play computer games in short spurts of about an hour or two; So it is somewhat rare for me to soak up entire evenings and weekends playing one game. In fact, I don’t actually recall the last (non Sims) game that I have been this engrossed in. It may have actually been Skyrim. 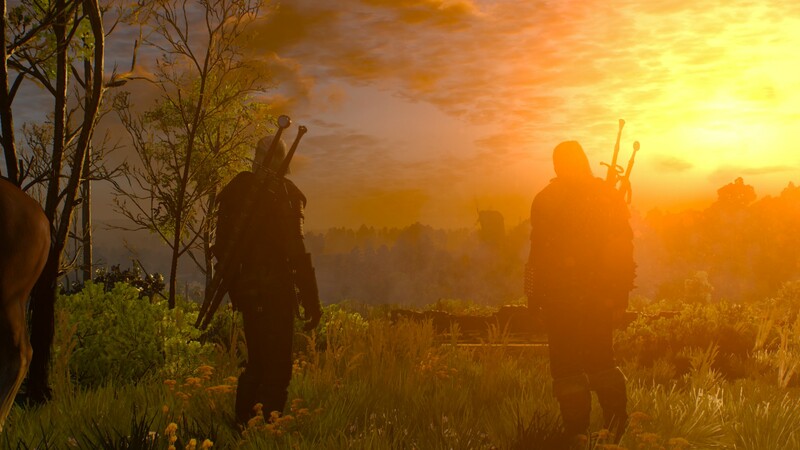 The Witcher 3 has a healthy mix of magic, fantasy tropes, and political intrigue with a dark and grisly unforgiving overarching tone. If you were at all disappointed by how linear and on-rails the first two titles felt, fear not: The Witcher 3 takes place in an open world environment. The map is absolutely massive and painstakingly detailed, without feeling like the game’s world was artificially enlarged for the sake of having an open world. You do not technically need to have played any of the previous titles to enjoy The Witcher 3, but it would help immensely with the back story and characters. Besides, both The Witcher as well as The Witcher 2 are fantastic games. At minimum, I would recommend reading a quick summary of the main characters and story thus far (most of of the major gaming blogs have posted several decent articles). The combat system is simple and fluid but precise. It’s a combination of physical melee attacks, dodging, rolling, and the use of magic signs to stun/burn/trap/etc. It is fairly unforgiving to key mashing and will punish careless hacking and slashing harshly. In the Witcher 3, having a good defensive plan seems to be key to success. Extremely fun but yes, there is a lot of rolling and quen spamming. In that regard, several blog posts and threads recommended playing the game at the 3rd level of difficulty, Blood and Broken Bones so that is what I am rolling with. The difficulty curve is rough at lower levels but I have heard that at lower difficulties, the game is too easy at some point. Either way, you can change the difficulty at any time (which I had admittedly had to do once). They brought back the potion toxicity system. In the Witcher 2 however, toxicity only governed the cap on potion buffs. If you reached 100% toxicity, you simply could not drink any more potions until you had meditated. There were no real negative effects. In the Witcher 1 as well The Witcher 3, you begin to suffer from negative effects if your toxicity rises too high. I don’t think the game will outright let you kill yourself via potion overdose but if the bar is too full your health will start to drop. The potion system by the way, is WAY less tedious than the previous titles. You only really need to gather ingredients and craft the initial potion (which is good for several uses before it empties). As long as you still have the empty potion bottle in your inventory, Geralt will automatically refill all potions after meditating for at least an hour. A potion refill costs one bottle of alcohol. 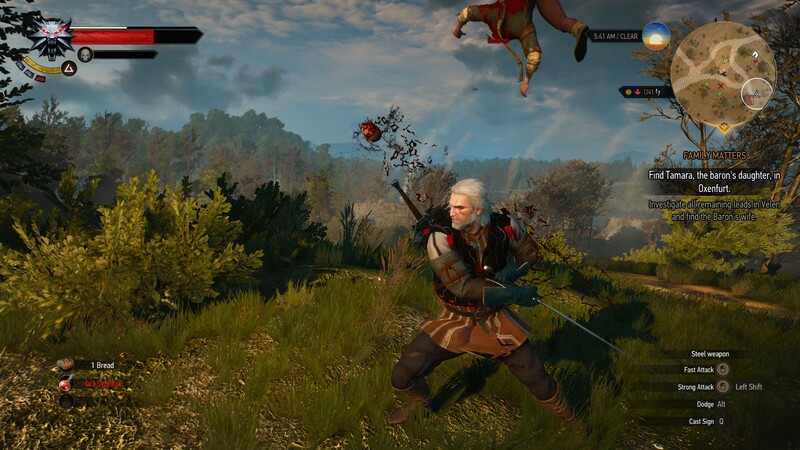 I like how integral consumables are to The Witcher 3’s gameplay. It is also nice seeing anti-potion spam mechanic in place that is more original than adding a 2 to 5 minute cooldown. I find the movement system in this game to be somewhat awkward because of my personal preference in movement keybindings. In the Witcher 3, the ‘a’ and ‘d’ keys are bound to turn left and turn right. My preference is to have the ‘a’ and ‘d’ keys bound to strafe left and strafe right. Unfortunately, there isn’t any in game way of rebinding the movement keys, which is sort of bummer for a PC game. If I recall correctly, you should be able to manually change the movement keybindings by editing a .ini file but at this point I have become accustomed to having to keyturn. 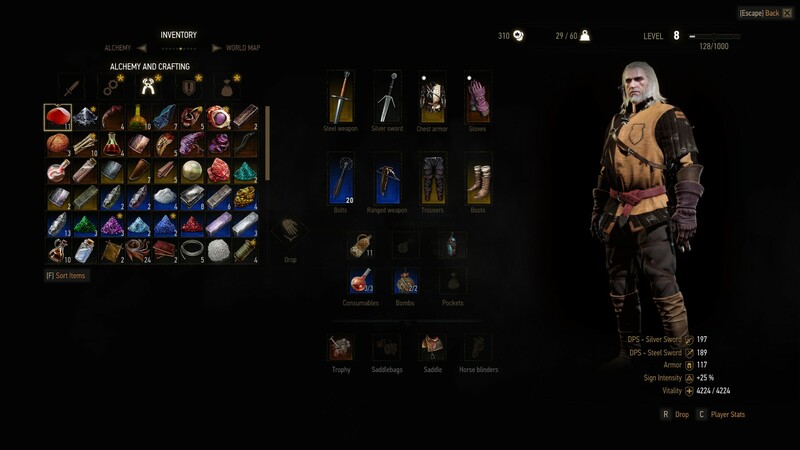 The inventory system however, is pretty godawful. There are tabs for gear, consumables, crafting items, quest items, and other stuff. Aside from those tabs there really isn’t any way to search your inventory or further organize items, so everything just ends up in one giant tab of crafting crap. There is also no non-personal inventory storage system. So if you want to stash something for later, it needs to be dropped on the ground. On the other hand, items that you drop on the ground don’t seem to ever disappear. So as a workaround, what most people seem to be doing is choosing a specific place to drop items for later use; Usually a spot next to one of the fast travel points. Graphically, the game is gorgeous and is being hailed by many as the “new Crysis.” Facial expressions, voice acting, and character animations are pretty good. The Witcher 3 doesn’t seem too taxing on my system. I am able to play it on high and retain a decent framerate, which is what I would expect from my system I guess. 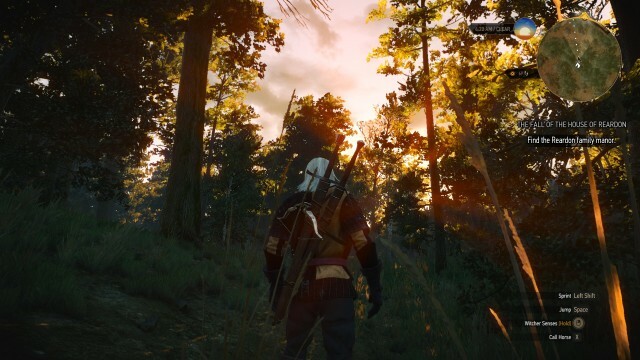 All-in-all: The Witcher 3 is exactly what I was hoping it would be.